Like many of my illustrator friends, I’m in the process of revamping my portfolio for the L.A. SCBWI conference. This weekend I took an existing design that I liked and gave it an update. “The Dance Lesson” is an illustration that my marvelous agent pulled from the slush, so it will always be close to my heart. It also inspired a picture book WIP that I love. But two years have passed since I finished that collage and I knew I could make it better. So, on Saturday, I set to work. 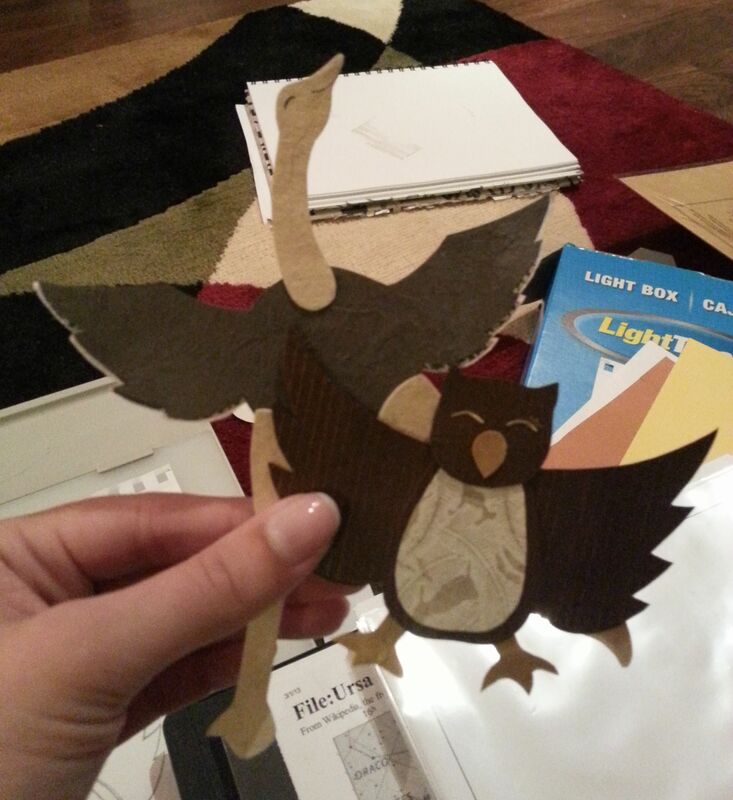 I began with Owl and Ostrich. These characters have evolved somewhat since the original design, so I wanted to make sure they would be consistent with the most recent O&O illustrations. Both Owl and Ostrich lost a toe to better resemble their real-life counterparts (ostriches have two toes and great horned owls have three in the front and one in the back). Owl 2.0 is a bit more solid with a larger beak. Ostrich 2.0’s legs are a bit longer and more muscular. I also adjusted the tilt of the birds’ legs and wings so they’d look more active. After all, they are dancing! The revised characters have different papers, too. 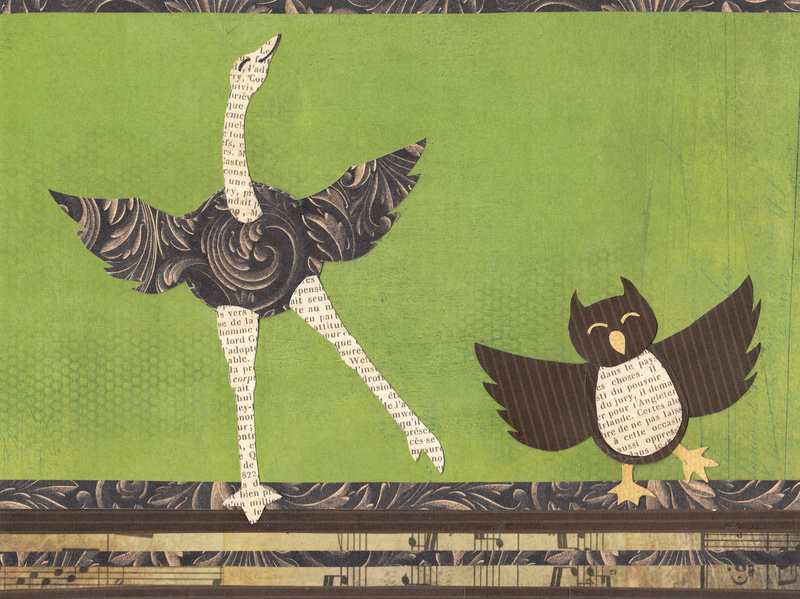 The first version of the illustration featured three patterns for Owl and two patterns for Ostrich—with one of these papers (the pattern with the text) being shared by the two. To compare, Owl 2.0 and Ostrich 2.0 have five papers a piece. Happily, I had already planned out O&O’s new looks in an earlier color study, so I didn’t need to start from scratch when picking their papers. 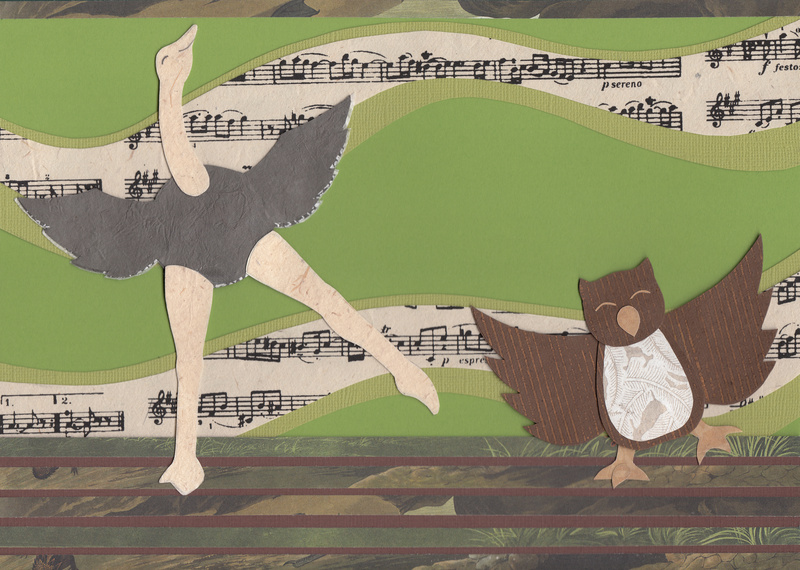 As for the background, I knew that I wanted to keep some elements of the first illustration (i.e., the natural palette, the floorboards, the border along the top, the music notes), but I didn’t know which papers I wanted to use. So, on Sunday, I spread out every blue, green, and brown paper pattern I owned and did a lot (ahem, a LOT) of pairing and considering. Yesterday was one of those days where the scene just wouldn’t come together. At one point, the husband suggested we get out of the house to think and eat pie. (Always a good idea.) At another point, we went out to buy yet more green paper. (Another good idea.) Finally (finally! ), I figured it out and was able to finish the illustration. The floorboards are still dark, the composition similar. The biggest difference is the backdrop. Instead of incorporating the sheet music into the floorboards, I cut waves from a sheet music paper pattern and layered them atop a different shade of green. My hope is that this detail adds more movement and interest to the illustration. What about you? Do you have some “before and after” illustration examples to share? I’d love to see them. 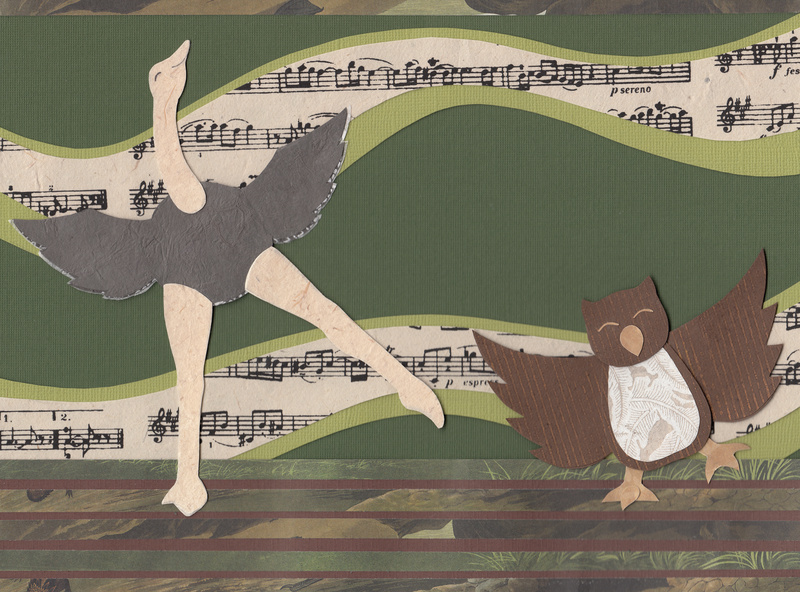 ETA: I still wasn’t happy with the background, so I tried out a few more greens, including one from a different Owl and Ostrich composition. I shared the results with a trusted critique partner and she agreed that, in this case, darker is indeed better. (Thanks, Courtney!) The after after illustration is below. This just goes to show that there’s always room for revision! My QueryTracker Success Story is up! I shared my writing process, favorite resources, query letter, and how I came to be represented by the splendid Kristin Vincent (née Miller) of D4EO Literary Agency. Check it out here: http://querytracker.net/success/priscilla_mizell.php? January 20th in	About Me Blogged!